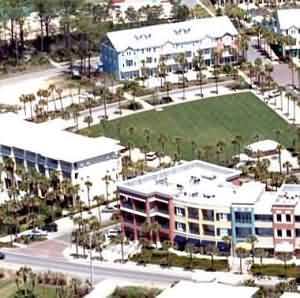 Santa Rosa Beach Beach Florida, And Destin Area Resort Info. You will find neat vacation rentals at Santa Rosa Beach, and you will be surprised at the natural beauty of this laid back beach. There are several restaurants, good shopping, and fun things to do here. Santa Rosa Beach is about seven or eight miles from Miramar beach, and about fifteen miles from Destin Florida. If you are one of those folks who are looking for a secluded beach you will like Santa Rosa Beach. It has white sand beaches and emerald green water. There are two convenience stores, but if you need a lot of groceries you can stop in Destin, DeFuniak Springs, or Panama City on the way in. You are only fifteen miles from town, so if you need something after you get here it isn't a bad drive. There aren't a lot of people on the beach, and it has a nice secluded feel. The beach is great, miles of white sand beaches kissed by emerald green water. There is a large school of dolphins that swim up and down the beach. If you are out on the beach early in the morning, or around sundown, you may see them. Sometimes if you are on the beach around sundown you may see the green flash. The water turns an incredible shade of green, just for a few minutes. Enjoy your vacation! You can click the Destin Beaches button below for another destin resort Florida doesn't have any beaches like these anywhere else.